1. Preparing your meals ahead of time. The thought of making your meals for the week can be overwhelming, but it is probably the most important tool you can use to succeed while on your weight loss journey. If you have never cooked in bulk before, it’s time to try it out. My suggestion is to set aside a couple of hours every three to four days to cook up staple proteins such as chicken, complex carbs like brown rice, and slice up vegetables, so you can easily grab and go. Don’t forget to pick up a lunch bag, ice pack and reusable food containers. 2. Navigating parties and dinners out. You’re bound to have parties or holidays to attend along the way, so it’s important you are armed to make the best choices you can. Aim to get a good workout in that day to burn calories and increase your energy level. You will make stronger choices when you feel confident about yourself and your body. Stick to your normal meals and portions during the day before your big event – you will be less likely to overeat. If you are going out to dinner, check out the menu online ahead of time to find out what options are best for you. If you are going to a friend’s house, offer to bring a dish or platter that you know is part of your meal plan. Often our portions get influenced by what we are served at restaurants, so it is important you know how to balance your meal with the correct amounts of the different food groups. Your plate should be made up of the following: 1/2 plate colorful vegetables, 1/4 plate protein, 1/4 plate grains. 4. Staying motivated, even if you have a bad week. Let’s face it– life happens, and you are bound to have a bad week once in a while. I think it’s incredibly important to take progress photos and track your body’s measurements. These tools are incredibly helpful when you are a few weeks in to your journey and you can begin to physically see changes. Whatever you do, don’t lose hope. There are so many variables that can cause your weight to fluctuate. 5. Starting up at the gym. Gyms can be intimidating, but you have to remember everyone who goes to the gym is there for the same reason, regardless of their size or shape. If you are shy or unsure how to use the equipment, ask one of the staff members to show you how to properly perform the exercise, or pull out your smart phone and look up the exercise. 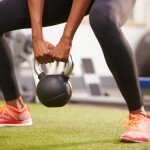 You could also sign up to take a fitness class that incorporates weight and cardio to help you become more familiar with standard movements like squats, lunges and push-ups.